We excel in every aspect of our Dallas Fort Worth commercial roofing services. As far as the roofing contractor industry goes we set higher standards. If you are looking for a DFW TX commercial roofing company that puts its customers first; give us a call today. We do not trade profit for quality. Our commercial roofing contractors are highly skilled. and ready to do the job right. We address Quality as well as price. For a FREE quote give us a call today at 817-381-6855. We understand fully what it takes to provide the best service in the commercial roof industry. Your Local Roofing Company has great repair crews on staff to take care of any of your Dallas Fort Worth commercial roof repair needs. We have experienced tear off crews to install new commercial roofs as well. If we put a roof on for you we ensure minimal to no impact on your daily operations. Our trained commercial roofing staff members are very safety conscious. If you are in need of commercial roofers and think you could use our services give us a call. We have many different options available to you. We can offer peace of mind and quality you can trust. Our professional Dallas Fort Worth commercial roofing staff knows what it takes to be a great DFW commercial roofing company. We believe highly in making our clients a priority. So let me thank you for considering Your Local Roofing Company to take care of your commercial roofing needs. We can schedule for one of our English speaking All American roofers to meet with you as soon as today. Of course we offer FREE phone consultations. Give us a call and we can let you know exactly what we can do for you. Sometimes we can give a ballpark quote right over the phone. Then we can schedule a meeting time that is convenient to you. A well informed property owner is a happy one. DFW Best Roofing can have a roofing expert from our company explain in detail what we will provide to you during the process of putting your new commercial roof on. We provide pictures as a visual aid as well. This way there are no unanswered questions. Our roofing experts will keep you well informed from start to finish. A great thing about working with a reputable DFW (Dallas Fort worth) roofing contractor such as ourselves, is we relay some of the questions and answers from past property owners to our current roof customers. This way our clients are undoubtedly well informed of the entire roof process before any roof work even begins. DFW Best Roofing knows what it takes to be a great Dallas commercial roofing company. Your DFW Best Roofing is the area commercial contractor of choice year after year. We believe every roofer of our company should be held to a higher standard. We know they are the building blocks and foundation of what makes a great Dallas commercial roofing contractor. That belief is one of the reasons we excel in this industry. Contact the #1 Dallas commercial roofers. Our qualified roofers are ready to speak with you.We are an accredited Better Business Bureau business. 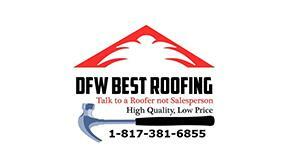 Check out Your DFW Best Roofing the commercial roofing company of choice on the BBB! You can also email us at info@dfwbestroofing.com. We are the #1 rated Dallas commercial roof repair company in the area. We specialize in every major category of commercial roof components, commercial roofing materials, and commercial roof systems. With this broad based knowledge of the commercial roofing industry we can fix any Dallas commercial roof repair that you may need fixed. Call us today for a free quote.An important factor to consider when trying to find a great Dallas commercial roof repair company to fix your leaks the right way, is dependability. If you call us to look at a Dallas commercial roof repair for you, we will be there when we say we will meet you. Not only that, but we have on call roofers ready 24 hrs a day/ 7 days a week that will answer your call at any time of the day or night. Whether it is raining or the sun is out. That’s the kind of professionalism you deserve in choosing a great Dallas commercial roof repair company such as ourselves. We give you our word you will receive an honest assessment of your commercial roof repair that you need fixed. After our assessment we can discuss a couple of different options that will work for you in order to get your commercial roof repair fixed correctly the first time out. After you select which option is best for you and we can schedule you in for the Dallas commercial roof repair at a time that is convenient for you and your home or business. While we are on your property conducting your roof repair we will do so with the greatest amount of precautions necessary in order to get the Dallas commercial roof repair done safely and correctly. It is our job to give you the best service possible. It is also our job to stop your leak and get your commercial roof repair fixed correctly the first time. We pride ourselves on our professionalism and great work ethic when conducting our Dallas commercial roof repairs. We do a lot of our work off referrals. Making you happy is of great importance to us when fixing your Dallas commercial roof repair for you. We look forward to talking to you, and discussing your commercial roof repair options with you. Have a fantastic day, and thank you for considering us as the roof company you choose to take care of your Dallas commercial roof repair needs.